Go Giant Robot! – Retro video games, anime, cult classics, and geek culture. Retro video games, anime, cult classics, and geek culture. Spyro the Dragon is one the classic Playstation series I never got a chance to play growing up. With the upcoming remake, now seemed like a perfect time to see if the beloved series holds up without the benefit of nostalgia, and as for the first entry in the series, well it’s a bit of a mixed bag. Spyro fits firmly in the collect-a-thon genre. The main collectible are gems which are scattered throughout the world and can also be gained by defeating enemies and opening chests. Additionally, you can collect dragon eggs by chasing down quick-moving Blue Thieves, and free dragons that have been turned into statues. When you free a dragon, you are treated to a brief cutscene that will often give you hints about the game or a humorous exchange with Spyro, but some only say “Thank you for releasing me” which is a bit disappointing. Freed dragons act as checkpoints and allow you to save your game. Spyro’s movement is limited to 8 directions which makes him awkward to control at times. (I found that switching from passive to active camera helped.) However, collecting gems is made easier thanks to Spyro being accompanied by Sparx the Dragonfly who will collect gems near you so you only need to get close to gems instead of running straight into them. This is a great addition, but Sparx makes a really annoying sound every time he collects a gem and I definitely could have done without it (especially considering that the background music courtesy of The Police’s Stuart Copeland is really good). Sparx also acts as you health meter, changing color as you take damage. You can take three hits before Sparx disappears, leaving you with one last hit point and forcing you to collect gems with Spyro directly. You can refill Sparx’s health with butterflies that are released by attacking sheep and other animals. Spyro has two main attacks. He can shoot fire by pressing Circle or charge enemies by pressing Square, with certain enemies only being vulnerable to one attack or the other. Your fire breath has a very limited range and it’s sometimes hard to tell whether you’re close enough to hit enemies. The charge attack moves the camera behind Spyro and increases his movement speed and given the limited controls sometimes it’s hard to aim at enemies, which becomes especially annoying with enemies that can only be defeated by the charge attack and fire projectiles at you. You can also get a powered-up fire breath from fairies in the game allowing you to take down enemies that are otherwise invincible or only able to be defeated with the charge attack and open certain doors and treasure chests. This is the only power-up in the game and only appears on a couple levels, so it would have been nice to have a bit more variety in the moveset. Spyro can also glide by pressing X a second time after jumping, allowing you to reach far away areas. This is a pretty fun addition, especially considering the game’s impressive draw-distance for the era. Unlike other 3D games of the time, there is no fog hiding far away areas, and it’s really satisfying to see an area far in the distance and be able to glide right to it provided you have enough height. One minor quibble I have with the gliding is that you’ll keep gliding until hit something unless you press Triangle to cancel it. I always found myself holding down X to glide and releasing it when I wanted to land, so using Triangle took some getting used to. The hub worlds are really nicely done. Instead of just a basic level select, each of them is like their own mini-level, complete with enemies, collectibles and unlockable areas. I occasionally had some difficulty finding the entrance to a level, but since each world has the same number of levels, it’s easy to know if you missed one. The transitions between the hub world and levels are really nice too. Spyro flies into the gateway to each level then seemlessly lands at the beginning of the level after a brief loading. It’s a small thing, but it’s a nice touch. I really liked the enemy design in Spyro. There’s a good bit of variety and they have a lot of humor and personality. Some enemy types will even mow down others before you get to them, which is pretty entertaining. However, the bosses are a bit of a let down. They aren’t difficult (mosty your standard keep your distance while they attack and wait for them to become vulnerable) but each time you hit them, they’ll jump away to another platform and you’ll have to follow them and it just feels like padding. Apart from the final boss, they’re entirely optional too. When you defeat them, you only get the same gems scattered everywhere, and sure you get a lot of them but it’s still a bit anti-climatic. Which brings me to my next point, collecting gems gets really boring after a while. You need a certain number of gems (or sometimes dragon eggs or freed dragons) to unlock the next world, but other than that they don’t do anything. It’d be nice if you could buy upgrades or something with them. The bigger problem is because the same gems are scattered everywhere, there’s not much incentive to pull off tricky moves to get to hard-to-reach places. Each level has a locked treasure test that you need to find the key for (usually in an out-of-the-way or hard to reach location) and then travel back to, but all for your hard work are more damn gems, so unless you’re going for 100%, what’s even the point? There are some timed flying stages for a little variety. In these you’ll stay airborne the entire time, which flying through obstacles and destroying enemies and treasure chests in order to extend your time. They suffer from the same stiff controls as the rest of the game and if you bump into anything, you fall into the water and the level ends (though you don’t lose any lives which is nice). There are eight of each obstacle per stages and you need get all eight of the same type in order to receive any reward, and by reward, you guessed it, more gems. I never needed to complex any of them to have enough gems to progress so I mostly just skipped them. Just like the other bosses, the final battle against Gnasty Gnorc isn’t that great. First you need to chase down two Blue Thieves with keys running in a circle, then chase down Gnorc himself and hit him with your fire breath, after which he’ll run away and you’ll need to do some platforming over lava as the platforms recede into the walls. Hit Gnorc a second time and you beat the game. You’ll need to do this all in one go and there are a lot of sharp turns while chasing the thieves and Gnorc where it’s easy to run off the stage while charging. I enjoyed the Blue Thieves as a quick challenge in other levels, but running in circles over and over again isn’t my idea of a good time, and having the final boss running away from you the whole time isn’t exactly an epic showdown either. For all its faults, Spyro the Dragon does a lot of things rights. While it’s not the most exciting game in the world, the first Spyro lays down a very good foundation for the rest of the trilogy to build off of. With a bit of tweaking and some added complexity and variety, Spyro is a little dragon with a lot of potential and I’m eager to see what the sequels have in store. 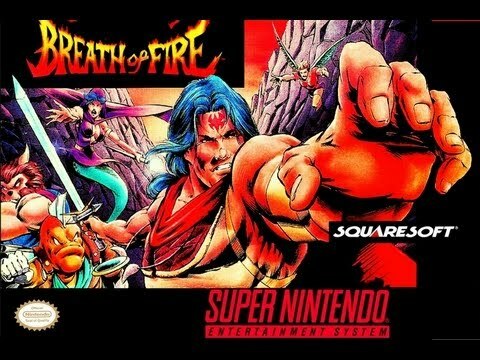 Breath of Fire is one of the more notable RPG series released on the Super Nintendo, but unfortunately it really doesn’t hold up to modern standards. If you’ve ever played a turn-based JRPG before, you know what to expect from the gameplay. Breath of Fire does try to do a couple unique things, with day-night cycles and hunting animals on the overworld, but other than that it’s really basic. Random battles are an annoyance for every RPG fan and it feels like you can’t go more than five steps without getting sucked into one. There is an item you can use to avoid them for a while, and an auto-battle feature that helps speed things along, but even by SNES RPG standards they’re way too frequent. What worse is that weak enemies from early in the game will keep showing up in later areas, giving you almost no XP or gold and just being an annoying waste of time. Other times, you’ll run into enemies with overpowered attacks that can wipe out your entire party in a single attack. The whole game is very poorly balanced and this extends to the boss fights as well. None of them are too difficult, but some are complete pushovers and are really unsatisfying to beat. The HP meters of enemies are usually visible when you attack, but for bosses once their HP drops to zero, they get a second wind and there’s no indication for how much HP they have. Most RPGs don’t display enemy health so it’s not a big deal, but why even include an HP meter for boss fights if it doesn’t really mean anything? The dungeons aren’t that great either. Their layout is fine, though not very memorable, but there’s not much incentive to explore since most chests only contain contain weak healing items that can be cheaply purchased in shops or armor and weapons that were usually weaker than what I already had. Occasionally you will find more powerful healing items that are available in shops, but after about the hundredth time I opened a chest to find nothing but an Herb, I just started rushing through the dungeons’ main path without exploring. The most important element in any RPG is the story, and in this respect Breath of Fire again falls flat. Your main character is Ryu the last survivor of the Dragon Clan whose town gets destroyed by the evil Dark Dragons. Most of the characters are fairly unmemorable takes on standard RPG tropes, and there isn’t much that veteran RPG fans haven’t seen done much better elsewhere. The dialogue is really bland too, but this might just be the translation. There are a couple nice set pieces, like exploring a giant stone robot who then sacrifices himself in a volcano, but these are few and far between. There’s one moment in the game that is so annoying that it deserves special mention. When you reach the town of Bleak, an NPC will request a Gold Nugget, the most expensive item in the game, in exchange for a key item needed to progress. If you know ahead of time you need save up for it, it’s not too hard, but there’s no indication this is coming, so I ended up spending all my money on new equipment right before, and had to use a cheat to buy the gold nugget to avoid grinding potentially for hours just to afford it. There’s another character who asks for another gold nugget later on, but you’ll be able to find one in a chest before then, so isn’t quite as egregious. The first time however you have no choice but to buy one from a shop. I imagine a lot of players gave up on the game right there. One area where Breath of Fire does hold up is the visuals. Everything from the sprites to the backgrounds is great and there are some unique enemy designs. The music, while not as memorable as something like Final Fantasy, is really nice too. However, neither of these is my opinion are enough to make up for the games many flaws. Turn-based JRPGs are notorious for aging poorly, and Breath of Fire doesn’t do much to challenge that reputation. It’s not terrible, but it has some deep flaws in its design and given the time commitment required, I really can’t recommend it unless you’re RPG fanatic who’s just looking for something familiar to kill time. From what I hear, the later titles in the series are a lot better, so I’ll have to check them out sometime and let you know if I like them anymore. At first glance, the “Marineford Arc” of One Piece is just like the previous arc: a lot of fighting and running. However, everything about “Marineford” is done in a far superior way to “Impel Down”. The scope of the battle at Marineford is huge, with dozens of characters both old and new, and while the structure of “Impel Down” was fairly straightforward (run to the bottom of the prison and then run back up), “Marineford” is full of twists and turns that kept me entranced throughout. There are a ton of “wow” moments, far too many to list, and these are expertly balanced with more intimate character beats that retain the show’s emotional core in the midst of all the action. The star of the show is without a doubt Whitebeard, whom Oda has only really teased us with before. Whitebeard is one of the strongest characters in One Piece so far and seeing him unleash his full power is incredible. Whitebeard has long been mentioned as one of the most feared and respected pirates in the One Piece universe, and his characterization here makes it perfectly believable that he could command such loyalty from so many people. On the opposite side of the battlefield is the Navy fleet admiral Sengoku, who has a much more demure role through most of the arc, but provides an apt foil to Whitebeard. While Whitebeard’s guiding philosophy is based around love for his “sons” and securing freedom and wellbeing for those he cares about, Sengoku is driven by an impersonal sense of justice and maintaining order in the world. The war at Marineford essentially serves as battle between their conflicting worldviews. The true villain of the arc is the admiral Akainu. In contrast to Sengoku, he shows no respect for his enemies or even concern for the lives of his underlings. We aren’t given much insight into his motivations, but he seems far more driven by malice and hatred of pirates than any sense of justice, and he is fittingly vile for one of the major villains of One Piece‘s second half. “Marineford” has a mixed reputation among One Piece fans, with many feeling it is overly long and drawn out, but I was gripped by it from start to finish and devoured the entire arc in only a few days. (The One Pace edit only covers the first 10 episodes, but even with the slower paced official edit, I was never bored.) The “Marineford Arc” is a wild ride and serves as a fittingly epic close to the first half of One Piece. The premise for the “Impel Down Arc” sounds great. Luffy has to break into the most secure prison in the world to rescue his brother. At first, I really enjoyed it, but the arc just drags on for far too long, even with the One Pace version cutting out just over half of the run time. The entire arc follows the same formula. Luffy runs around trying to get deeper into the prison, fights a some guards or monsters and runs around some more. It gets really repetitive, and there aren’t a lot of emotional character moments to break up the action. Luffy is still separated from the rest of the Straw Hat crew, and instead teams up with some familiar (and flashy) faces from past arcs. I always love it when Buggy the Clown shows up, but apart from him all the other returning characters are from Baroque Works. It’s great to see the return of Mr. 2, and Luffy and Crocodile joining forces is an interesting twist, but it would have been nice to have more variety. There are also some new characters introduced. Jinbe, one of the Seven Warlords, befriends Ace before Luffy’s arrival and joins in Luffy’s escape, but he isn’t overly interesting. Emporio Ivankov, the “Okama Queen”, is essentially a super-powered version of Dr. Frank-N-Furter from the Rocky Horror Picture Show, and provides some good comic relief. We also learn that he is a member of the Revolutionary Army led by Luffy’s father, though we aren’t given any details beyond that. The villains in the arc are just okay. The Warden, whose body is composed of poison, is the most interesting but the multiple fights against him get boring after a while, and other enemies like the Jailer Beasts are completely generic. The arc is also pretty anticlimactic, which Luffy never even getting a chance to see Ace, and after running and fighting down the six levels of the prison for the first half of the arc, they then just fight and run up the six levels to escape. It gets really tedious. “Impel Down” doesn’t have a very good reputation among One Piece fans and unfortunately I have to agree. The “G-8 Arc” despite being filler handles the escape plotline in a much more interesting way, whereas “Impel Down” is just a bit of a bloated mess. This arc was really short so I don’t have much to say about it. It’s a pretty standard One Piece (though standard One Piece is still miles above most shonen). Luffy arrives a new island meets a bunch of quirky people, gets in some fights, and learns someone’s tragic backstory. Boa Hancock, the Snake Princess, is an okay character. The idea of woman so beautiful that she can compel everyone to do what she wants and Luffy being completely oblivious is a good gag, as is having her fall in love with Luffy, though her habit of kicking kittens, puppies and baby seals makes her less than likable. There’s a lot of set-up for future arcs. Luffy learns of Ace’s impeding execution and sets out to rescue him, and we see Luffy’s use of Haki in full force for the first time (after him briefly using it in his battle against Duval). It’s all very enjoyable and doesn’t overstay its welcome, but “Amazon Lily” is one of the more unmemorable arcs in One Piece‘s history. I had a lot of problems with the pacing of the previous One Piece arc “Thriller Bark”.. Apparently Toei decided that in an effort to keep ratings from dropping during filler arcs (which are necessary to keep the anime from catching up to the manga), they would instead use padding so that one episode of the anime would roughly equate to one chapter of the manga. I’m not a fan of this decision as it results in fans getting an inferior product, but there’s a reason it’s called the entertainment business. Luckily, a friend told me about a project called One Pace, which removes the padding so that the pacing of the anime more closely matches that of the manga. In the original anime, the “Sabaody Archipelago Arc” is 21 episodes adapted from 24 manga chapters, whereas the One Pace version is only 11 episodes. I haven’t watched the original anime version so I can’t compare the two, but for the most part, the One Pace version flowed very smoothly, and I certainly enjoyed it a lot more than I did the drawn out Toei version of “Thiller Bark”, so I’ll probably be sticking with it from now on. As for the “Sabaody Archipelago Arc” itself, I found it incredibly enjoyable. Keimi is a great addition to the cast, and Hatchan was one of my favorite parts of the “Arlong Park Arc”, so it’s great to see him return. The twist in the opening fight with Duval is hilarious and the Sabaody Archipelago itself once again shows Oda’s talent for crafting inventive, magical worlds with packed full of detail to make them feel real. The arc introduces a ton of new characters in a relatively short period of time, but even with the One Pace edits, it doesn’t feel rushed. Luffy’s rival rookie pirates have a ton of cool powers and I can’t wait to see more from them in the future, and Admiral Kizaru strikes a great balance between being likable and menacing. There’s also a lot of world-building with us learning more about the nature of the World Government as well as the truth behind Gold Roger’s death. With so much set-up and exposition, it would be easy for this arc to just be a boring infodump, but it’s entertaining from start to finish. The final battle with Kizaru, the Pacifistas and Kumo is gripping as hell. One Piece is full of instances of the Straw Hats facing insurmountable odds and somehow winning the day, and seeing them be so soundly and quickly wiped out really raises the stakes. (The cut to bubbles popping as Kuma does away with each of the Straw Hats is a really nice touch.) I can’t wait to see where the story goes from here. 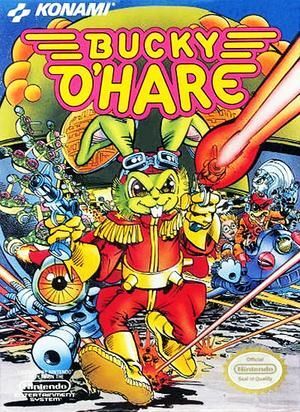 Bucky O’Hare is another great licensed game from the classic Konami library. You play as the titular Jazz Jackrabbit Bucky O’Hare who must rescue his crew from Toad Empire. The game features many similarities to Capcom’s Mega Man. At the start of the game, you can choose between four planets that can be played in any order, each of which has a different member of Bucky’s crew. Once rescued, you can switch between different crew members at any time by pressing the Select button. After rescuing all four members, the crew takes on the Toad mothership, with an additional four levels. The controls are very tight, which is a good thing since the levels can be very challenging, especially once you get on the Toad mothership. However, one very annoying thing about the game is that if you are hit while in midair, your jump is cancelled and you fall straight down. This wasn’t a huge problem for me and didn’t ruin my enjoyment, but it can be very frustrating at points. Each of the five characters have different primary weapons and special moves that can be activated by holding down the B button. This can take some getting used to. Bucky’s special move is a high jump, so I always found myself wanting to hold down the jump button instead. Most of the characters also go into a crouch when charging their special moves, but if you are crouching while holding down the B button, they don’t work. Each level has power-ups you can collect to upgrade your characters’ life bar and power meter to increase the strength of your special moves. Often these are found in out the way areas with trickier platforming, so there’s a nice risk/reward element. Each character shares the same life bar but have their own power meters that must be upgraded individually. However, upgrades carry over between levels, so it’s not too difficult to max out every character. While you can select any of the four planets at the start of your game, the Blue Planet can’t actually be completed unless you rescue Blinky from the Green Planet first. The Blue Planet is also the game’s ice level and slipperiness is even worse here than it is in most platformers, making it one of the most frustrating levels in the game. It’s always great in Mega Man when your acquired weapons allow you to access additional areas or power-ups, but allowing players to choose the order of levels and then making one of them impossible if played in the wrong order is bad game design. There is quite a bit of die-and-memorize gameplay on some levels, such as the Red Planet where you have to outrun one-hit death lava and you don’t have time to outrun it without memorizing the path ahead of time (and even then it’s still pretty hard). However, the graphics in Bucky O’Hare are really nice and soundtrack is great, so even when it gets frustrating, it’s still pretty enjoyable. One area where Bucky beats Mega Man is in the boss battles. There is a lot of a variety and most of the bosses have pretty interesting designs. There’s one level where you have to cross lava by riding on giant green balls only for one of the balls to turn into a robot you have to have to fight to finish the level. Bucky O’Hare certainly has its flaws, but for fans of NES platformers, particularly Mega Man, it’s still a lot of fun.